Korean Central Television is currently airing a 36-part drama series from Chinese state television in a departure from recent programming that has been almost exclusively domestic. The CCTV drama called “Mao Anying” (“모안영” “毛岸英”) covers the life of Mao Anying, the eldest son of Mao Zedong, and began airing in primetime on May 10. That was two days after Kim Jong Un returned from a two-day visit to Dalian where he met with Chinese President Xi Jinping. 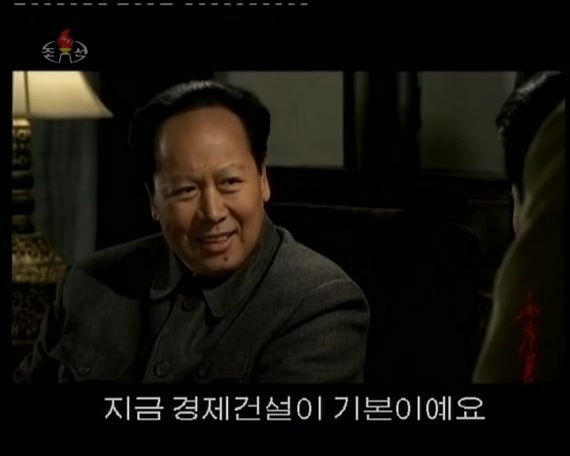 A scene from Mao Anying broadcast on Korean Central Television. The timing is almost certainly not a coincidence. 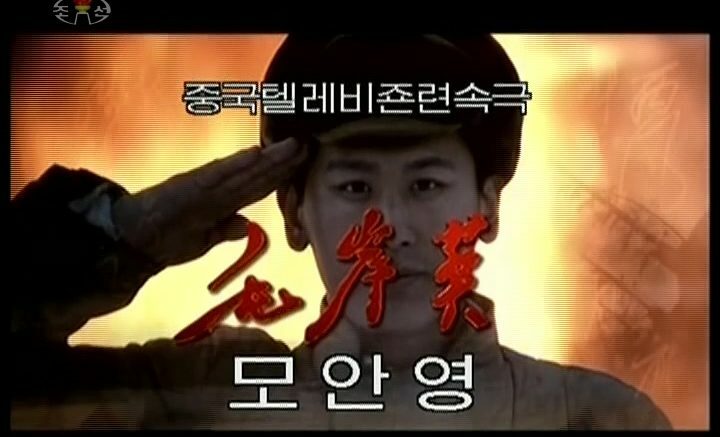 On April 1, four days after Kim Jong Un returned from his first trip to China, KCTV aired Meet in Pyongyang (“평양에서의약속” “平壤之約”), a 2012 DPRK-China co-produced movie in Korean and Chinese. It also had Korean and Chinese subtitles throughout and was previously broadcast in 2012 and once in 2014. In the last couple of years KCTV has rarely aired foreign programming so the drama and movie stand out, especially airing while the channel also broadcasts its signature documentary reports on Kim’s visit and warm reception in China. In April viewers also saw a 2007 documentary on visits to China by Kim Il Sung, including footage of his visits with Mao Zedong and Zhou Enlai. The broadcasts can probably be seen as an indication of warmer relations with China, but also a wish by the government to give China a better image among the eyes of the public. Kim Jong Un has pledged a renewed push on economic growth and China appears to be not just a potential model for development of the economy but also its prime trading partner. Over the same period there hasn’t been a major difference in portrayal of the United States or any greater acceptance of South Korean culture. The recent K-pop concert in Pyongyang was not broadcast on TV although clips were shown as part of a report on Kim Jong Un’s appearance there. This is the fourth time the Chinese drama has been broadcast on KCTV. It first ran from Nov. 25 to Dec. 12, 2010, and was immediately repeated from Dec. 13 to Dec. 30, 2010. Then it was repeated from Feb. 22 to March 16, 2011, but it hasn’t aired since then.